There's legend in Wales that many learn early in life, particularly those of us from families who are dog lovers. I can't remember how old I was when my mother first told me the legend of Gelert the Hound, but it struck a chord. It is a tragic tale of animal loyalty betrayed by human rashness and the aching remorse that follows. 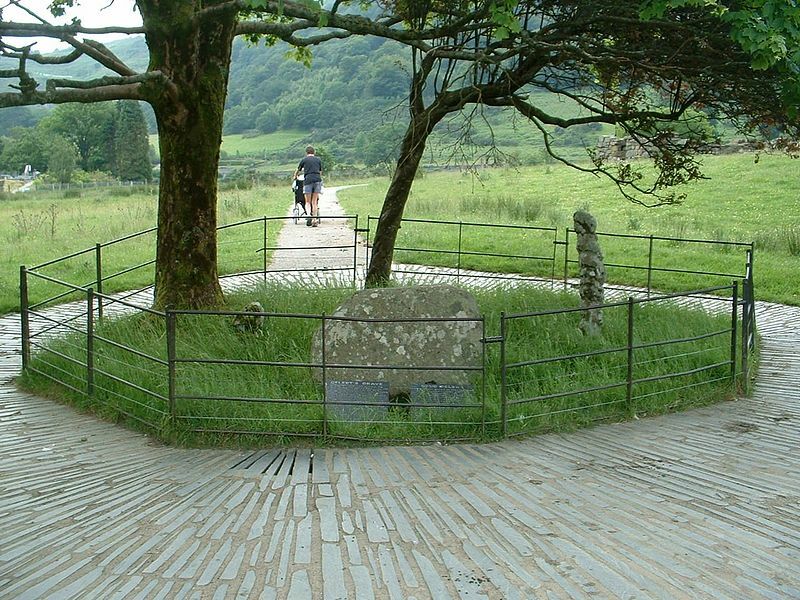 For those unfamiliar with the tale, I'll quote the inscription of the memorial slate at the supposed grave site of Gelert, in Beddgelert, North Wales. It's a moving story, one that part of me wishes was true because the story's moral: the cost of unjust human rashness creates tragedy every day. But alas, like many legends, even our most enduring, it is not true. The heart of the story is an ancient and common myth, that of the loyal animal betrayed through misunderstanding. The oldest known version is an Indian parable, The Brahmin and the Mongoose, which substitutes the hound for a mongoose and a snake for a wolf. This is a very well travelled tale, and you can find variations of it across Eurasia. In my native Wales, there is similar legend in the Mabinogion from which Gelert's story is partially derived. Of course, the stories of the Mabinogion pre-date Llywelyn the Great by many centuries -- which I'll address in a moment. So what's the real origin of Gelert the Hound? It turns out, it was a clever bit of marketing by a publican, David Pritchard, who wove the story to encourage tourism. Pritchard lived in Beddgelert from the 1790s and by mashing together different local legends and grafting them to a local monument, he created the modern myth and it went viral. Beddgelert was actually the resting place of Saint Celert, a 7th century hermit who was reputedly buried there -- Beddgelert is Welsh for Celert's Grave (Cs mutate to Gs in Welsh under certain grammatical constructions). So Pritchard had a name and he grafted on the 'faithful hound' story to give it a tragic origin. The association with Llywelyn the Great, is more interesting to me because most Welsh legends are typically attached to much older figures: i.e. King Arthur or those associated with him. What I think this reflects is the contemporary popularity of Llywelyn as a romantic and heroic figure, much the same way as Alfred the Great would become to the English during Victoria's reign. It worked very, very well. The story was picked up by several English poets and artists who spread its popularity throughout the English-speaking world. The moral core of the story, and its Gothic setting in 13th century Wales, struck a chord with the romantic Victorians. For the Welsh, it made a vague, ancient folk tale more immediate and tangible. It quickly ingrained itself in the catalogue of moral stories taught to children. The reason I got thinking about Gelert in the first place was because my sister pointed out in an email thread that the cover of the recently published Beren and Lúthien, by J.R.R. Tolkien, depicts a hound that looks like the classic interpretation of Gelert. The cover was painted by renowned artist Alan Lee. "And some things that should not have been forgotten were lost. History became legend. Legend became myth." Only, in this case, it was marketing that became myth. On the scale of Welsh history it wasn't that long ago nor did it take long to plant deeps root in our collection physique. Indeed by the 1860s, George Borrow noted in Wild Wales (1862), the myth was well known throughout the country. My feeling is that myths are made from the stories that most resonate with us. It doesn't matter if the origin was history, legend, marketing or propaganda. What's important is the story, the struggle of people, their victories and yes, even their failings because story tells us about ourselves and gives meaning to actions and our place in the world.